UNITED NATIONS, October 12, with interim update -- The UN's envoy to the Congo Alan Doss, during his last visit to the Security Council, bragged that he had given Congolese president Joseph Kabila the names of five military leaders accused of sexual abuse, and that action was being taken. On October 12, when Inner City Press asked U.S. Senator Barbara Boxer about the case, she said that only three of the officials have been relieved of their duties, and two remain in commanding position in the Congolese army. Video here, from Minute 10:13. Inner City Press then asked the spokesperson for Secretary General Ban Ki-moon, with whom Senator Boxer had just met about the topic, if Ban or the UN could confirm that two of the named abusers are still commanding FARDC units, and if so why the UN works with them. The spokesperson said, you have to ask... anyway it's something that concerns the Army itself, MONUC did not keep those guys on board." Video here, from Minute 17:55. There are other questions left answered by Doss and the Department of Peacekeeping Operations. Doss declined to comment on the scandal surrounding his written -- and leaked and published by Inner City Press -- request that the UN Development Program show him "leeway" and hire his daughter, an irregularities which led to a rare man bites man incident in UNDP. Supposedly Ban Ki-moon was expecting a report on l'affaire Doss / nepotism when he returned from summer vacation, but still hasn't gotten it. Well placed whistleblowers have approached Inner City Press with complaints against Doss they say are widely known in the Congo. The first involved his use of MONUC airplanes to fly his wife around, despite the fact that Congo is a non family post. More recently, Inner City Press has been informed that when he left the UN in Liberia to transfer to the Congo, Doss arranged that his cook in Liberia be given a job in Congo as MONUC engineer. Inner City Press more than two week ago asked the Department of Peacekeeping Operations to confirm or deny this, in an email sent to the highest levels of DPKO. To the same parties, a DPKO spokesperson has repeatedly asked for more time to answer -- a process that has gone on for more than two weeks. Now, as Doss comes to New York to once again brief the Council, we run this report, adding that sources say the cook / engineer is known as Papa Jacques. Source after source, in MONUC and DPKO, has said that Doss has abused his position, not only in pushing for rule breaking to hire his daughter, but in use of MONUC (and UNMIL) resources. What will happen? Watch this site. "MONUC reiterates that a full inspection was carried out and no weapons were missing as a result of the incident. Kenyan authorities have completed their investigation into the matter with the assistance of MONUC and DFS. MONUC is following up and actively looking into how security can be enhanced". UNITED NATIONS, October 12 -- As the issue of Western Sahara is once again debated in the basement of the UN in New York, in Morocco the government detained seven officials of the Polisario Front upon their return from Algeria. 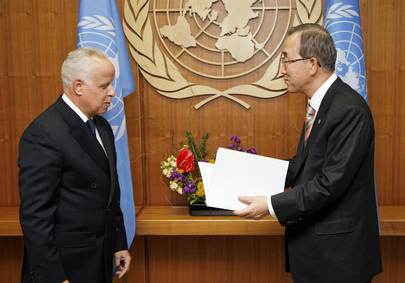 Polisario's leader Mohammed Abdelaziz called on the United Nations to intervene on what he called an abduction. But when, two days later, Inner City Press asked UN Spokesperson Michele Montas for the reaction of Secretary General Ban Ki-moon, or by implication his envoy Christopher Ross, or even if Mr. Ban is aware of the detentions, Ms. Montas said "I am not aware of it." Video here, from Minute 23:18. The discussion of Western Sahara at the UN gets more and more surreal. On October 8, correspondents were invited to what was advertised only as a briefing on the topic. Once there, a representative of Morocco's Mission to the UN translated, Arabic to English, the statement of one Ahamadou Souilem of the Oulad Dlim tribe, who said that "being convinced that the Polisario cause is worthless and its ideology founded on baseless myth," he "decided to head back to his motherland, the Kingdom of Morocco, in July 29th, 2009." Afterwards, Inner City Press asked Ahamadou Souilem who has the right to trade away the fishing rights and other natural resources of Western Sahara. Ahamadou Souilem's long answer, in Spanish, essentially said to look to the future, not to the past, that restrictions on the natural resources of colonies refers to Spanish occupation and not the present arrangement. During the UN General Debate, the representative of the military regime in Guinea spoke in favor of Morocco and its autonomy -- but not independence -- plan. A Polisario representative told Inner City Press that Morocco provides training and assistance to the personal guards of Guinea's military leader. Inner City Press asked Morocco's Ambassador to the UN about this on October 8. He looked taken aback, and said that all matters are "in the Fourth Committee," and that it is important to be diplomatic. This was two days before the arrests in Casablanca, and now the UN's silence. Watch this site.